Mascot Willie Water is MAWSS’ ambassador for clean water. He attends environmental events in and around the Mobile area, promoting clean water practices to all. 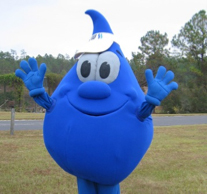 Our giant water drop does not speak, but is always happy to pose for photos with children of all ages. Appearances by the mascot require advance notice and approval. A secure, private changing area for the mascot is required. The appearance must be in conjunction with a community event that reflects MAWSS’ mission. The event must be located in the MAWSS service area. Send requests in writing to mallen@mawss.com. Location: 4725 Moffett Road Lunch will be provided. Make plans now to participate in the Alabama Coastal Cleanup on Saturday, September 15th, from 8am 12pm.